When my wife was first diagnosed and treated for cancer, anytime we shared positive news about the success of her treatments, one of our friends would invariably respond, “God is good.” And when we were told that her cancer was gone, we were eager to shout “God is good!” as well. But her cancer returned, and spread. Does that mean God is no longer good? It’s easy to say, “God is good” when prayers are being answered beyond our wildest dreams, but when things do not go as we hope, can we still say, “God is good”? Psalm 100:5 says, “For the Lord is good; his steadfast love endures forever, and his faithfulness to all generations.” So what about those times when we are hurting and crying out and our prayers are not answered as we hoped. Does that mean that God who is so gracious and faithful has suddenly become stingy and unreliable? Not at all. 1. God is good all the time because He is perfecting our character through our trials. I wish that we could honestly say that we can learn the most important lessons of life and godliness without ever going through pain and heartache. But that just isn’t true. We’d all like to think we are eager to listen to God and compliant with His will, but the reality is that complacency and forgetfulness come too easily to us. And God wants us to learn and grow. He didn’t create us to be computers that are simply programmed to create whatever output He wanted. He created us to be in a living, loving vibrant relationship that we freely choose, and part of the learning and growing that make this relationship possible is the Lord’s discipline. God uses suffering to discipline us, to teach us, and in particular, to teach us to share His character and holiness. “For the moment all discipline seems painful rather than pleasant, but later it yields the peaceful fruit of righteousness to those who have been trained by it” (Hebrews 12:11). These are tough lessons, hard lessons, but they are good lessons. “But God, who comforts the downcast, comforted us by the coming of Titus, and not only by his coming but also by the comfort with which he was comforted by you, as he told us of your longing, your mourning, your zeal for me, so that I rejoiced still more” (2 Corinthians 7:6-7). I’ve had moments in my work for the kingdom when I was discouraged, when I felt betrayed, when I was bitterly disappointed in people. But in everyone of those moments I have been blessed with countless Tituses, calls and visits and emails from people, some of whom I had never met and only have in common the bond of faith in Christ. Paul says that is God’s doing. After all, why do we have such a family if not for Him? God is good all the time. 3. Finally, God is good all the time because He has promised us eternal glory after our suffering. Yes, Peter acknowledges, we must endure a time of testing (1:6-7). But this testing is not an end, but the means to an end of God’s glorious purpose. “Though you have not seen him, you love him. Though you do not now see him, you believe in him and rejoice with joy that is inexpressible and filled with glory, obtaining the outcome of your faith, the salvation of your souls” (1:8-9). Why was Peter so sure of this? Why did he preach even after the Sadducees arrested and beat him and threatened him? Why was he willing to give his own life, and exhort others to endure the fiery trial? Because he had seen the risen Lord. Look at verse 3 – our hope is “through the resurrection of Jesus from the dead,” and because he knew that God kept His promise to Jesus he is sure God will keep His promise to us. 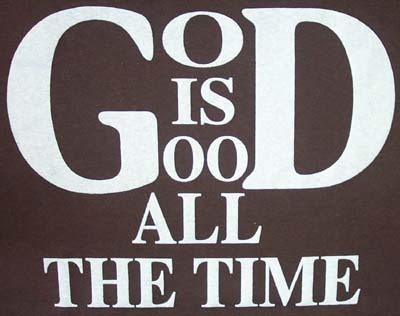 Because God is good all the time. God is good to help us grow and strengthen and learn lessons we would not otherwise have known if we didn’t go through trials.